There is nothing more frightful than the thought of your little one suffering from any sort of emergency, but the reality is that one can happen at any moment. When it comes to dental emergencies, your pediatric dentist in Birmingham says it’s best to be prepared by knowing how to respond. As you read on, you’ll learn what to do for some of the more common types of emergencies. Now let’s look at some of the more common types of dental emergencies parents encounter. For a Primary Tooth – If it’s a primary tooth that’s been prematurely lost, then try to locate it and bring it to the dentist to have it reinserted. For an Adult Tooth – If your child loses a permanent tooth, then place it in a cup of milk to keep the roots alive until it can be reinserted by your dentist. 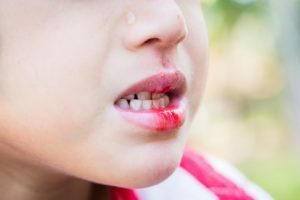 If your child severely bites his or her lip or tongue, the first step is to clean the area gently with a cloth and apply light pressure with a cold compress to alleviate any swelling. For any bleeding that continues for more than 10 minutes, immediately head to your local emergency room. A broken tooth can be painful and can lead to infection. To prevent that, rinse your child’s mouth with a salt-water solution and apply a compress to reduce any swelling. If your little one has had a bad fall or has received trauma to the face, and you fear that his of her jaw is broken, then immediately head to the emergency room. A toothache can be brought on by a broken tooth or bacteria infection. To address this painful situation, rinse your child’s mouth with warm water to clean the area. You can also use dental floss to carefully maneuver around the teeth to dislodge any items that may be causing irritation. Although dealing with dental emergencies can be unnerving for you as a parent and uncomfortable for your child, by knowing what to look for and having a plan of action, you can stabilize the situation faster. Then, with the help of your pediatric dentist, your child can fully recover and get back to enjoying the fun of being a kid! A wife and mother of four children, Dr. Angelica R. Rohner understands how alarming an emergency can be for a parent. 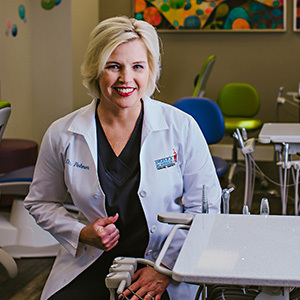 Thus, the University of Mississippi School of Dentistry graduate offers parents the peace-of-mind of knowing that whatever dental emergency their little one may have, there is expert help available to correct it. Dr. Rohner treats children of all ages at her private practice, and she can be reached for more information through her website.